Blome’s Paperie is the creative design studio of paper and installation artist Sarah Blome. Blome’s Paperie designs bridge the junction between craft and fine art. Each project is handcrafted and while each piece is predominantly crafted from paper, pieces may include materials found in nature, metals, fabrics, and other elements which highlight the overall beauty, design and theme of the installation. Blome’s Paperie specializes in Couture paper flowers for the discerning client. Art pieces reveal a softer side to the art of paper sculptures, incorporating papers with a wide variety of textures, sheens, and opaqueness adds elements of tonality and softness to their work. Each piece is extremely detailed, with flowers ranging in size from 2 inches to 3 feet; many include hand painting, overlay, appliquéd or other detailing. There are no set flower templates, patterns or colors, each flower and installation piece is designed hand-in-hand with each client, from concept to execution, to meet each unique commission. Blome’s Paperie epitomizes “Paper Fleur Couture” providing both luxury and artistic aesthetic to their clients. The aim of each paperie product is to provide an artistic creation that is cohesive to the overall brand, style and story of the client. Alongside the design service Blome’s Paperie has rentals available and has been working on a range of framed floral artworks and gifts available soon from an online shop. Preparation for a wedding is stressful but working with Sarah was so fun. You can't select a better wedding partner vendor than Blome's Paperie. Responsive to all our requests, and there were many last minute changes/additions on our part and she always said " oh sure we can"! Sarah is a delightfully charming, kind woman....the FLOWER WALL was AMAZING...along with flowers on both sides of the aisle; flower girl flowers, and Sarah decorating cake table! All of this with a smile and genuine concern that all was perfect and it was. 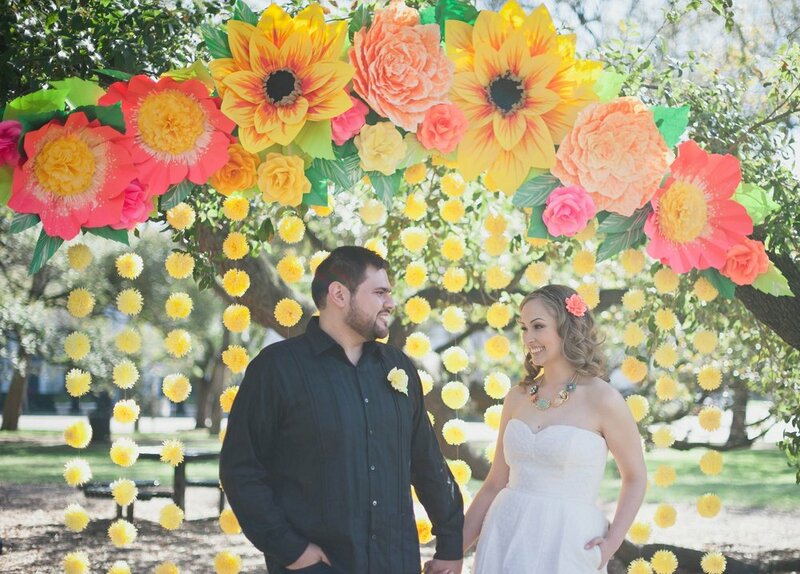 My favorite decor at our wedding was the beautiful paper flower wall rented from Sarah at Blome's Paperie. 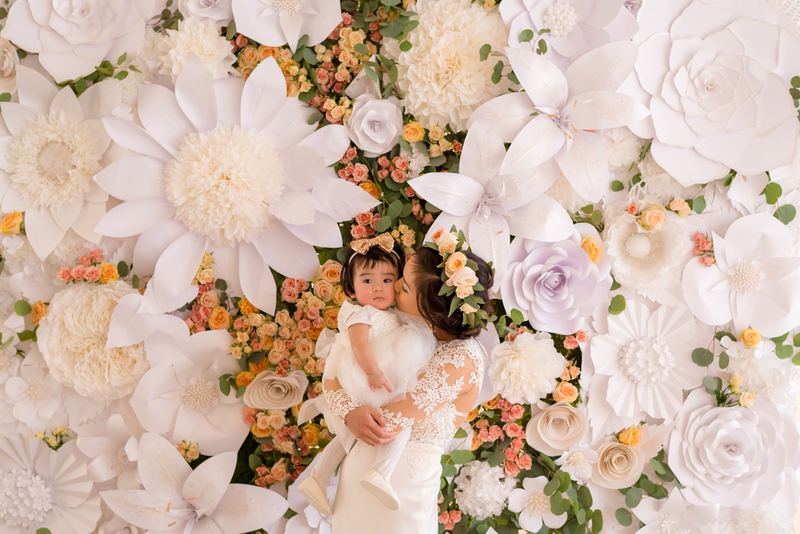 I was turning through Weddings in Houston magazine and landed on a page where the entire wall was covered in white paper flowers. I just had to have it as the backdrop to our summer wedding. Sarah was so fun to work with and easy to contact. We talked about the many size options and chose a 10ft x 16ft. Not only did I decorate our wedding around the flower wall, but it was also my favorite spot to take pictures. Wedding guests were amazed at the wall, and as the bride I don't think I ever let it. If you want an original piece at your wedding I reccomend Blome's Paperie paper flower decor. It was best part of our wedding!! Sarah, was an absolute joy to work with and was very accommodating with helping me find the right thing for my daughters reception and her set-up and take down was flawless. It was an enjoyable experience from start to finish in every way! Blome's Paperie made my wedding so extravagantly beautiful. He were designs were so intricate and fun. The designer is a truly an artist. She made sure I was happy, and helped me figure out what I wanted, and made it PERFECT! Sarah Blome was one of my most favorite vendors of my daughter's wedding. She is talented, willing to please and went way beyond to make our wedding beautiful and special. She put her heart and soul into her exquisite white flowers and really cared about wanting to make us happy. Our wedding was beautiful with all of her hard work and passion in her craft that made Sarah Jane one of the happiest brides. I wholeheartedly recommend her, she is a delight , aims to please and is quite an artist. I see extraordinary things ahead for Sarah Blome.